You can’t mention isotonic sports drinks without somebody telling you that you don’t really need them. It’s true, and we’ve covered it in our guide to what to drink for sports: most people don’t need to be drinking sports drinks if they’re doing exercise for 60 minutes or less. But the fact is that we are drinking them, millions of them, and let’s face it: drinking something is better than nothing. So let’s look at what goes into them and how you can make your own, improved version. 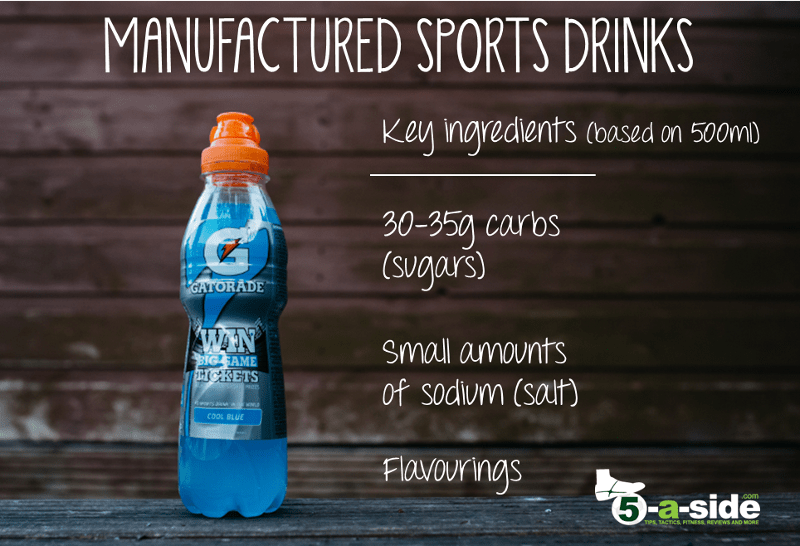 So you want to make your own isotonic sports drink – what should it contain? Carbohydrates: these are sugars that provide the fuel for working muscles. Sodium: essentially just salt. A small amount of this helps speed up re-hydration. It maintains your fluid balance and replaces the salts that are lost in sweating. Drinks companies spend a lot of time refining their mix of carbs and salts, generally trying to come up with an ‘isotonic’ concoction (though there are also hypertonic and hypotonic versions – see here for the difference between hypertonic vs isotonic vs hypertonic drinks). If a drink is described as ‘isotonic’ it means that it contains similar concentrations of salt and sugar as in the human body. In other words, it will contain between 6% and 8% carbs (sugars). 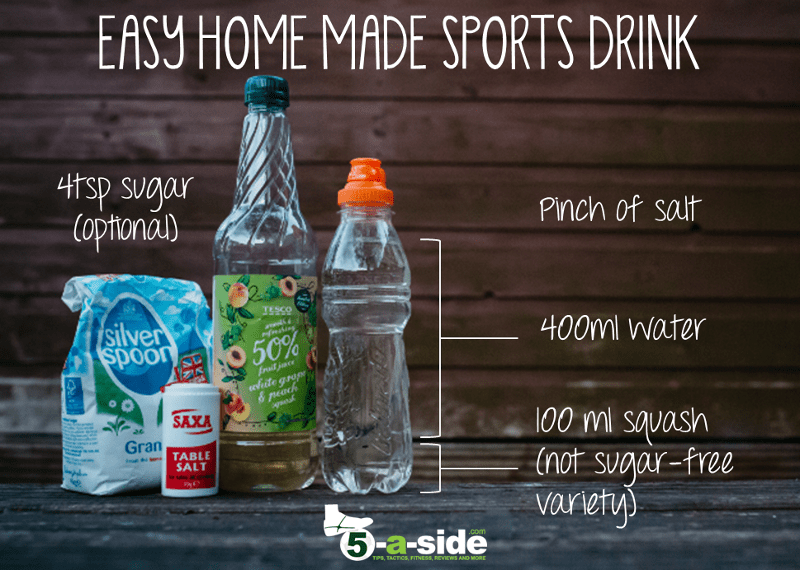 But did you know that you can make your own sports drink simply, cheaply, and more naturally than the major brands? 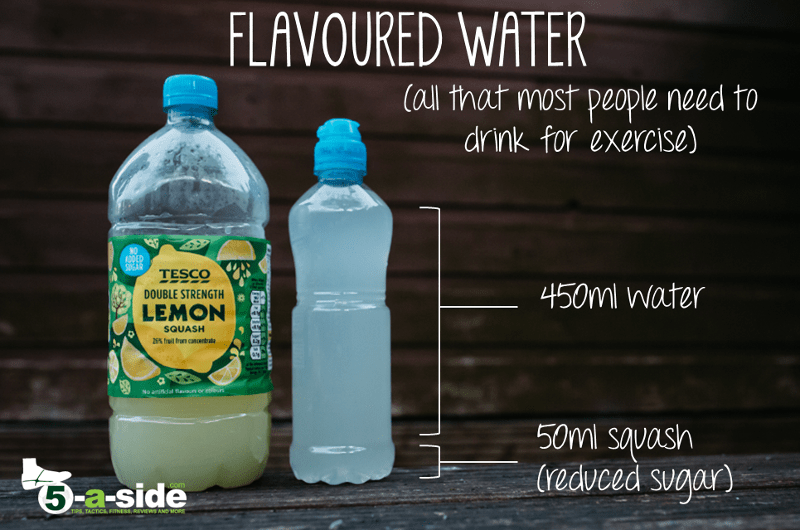 We’re going to show you six alternatives to the sports drinks you can buy in the shops. In each case we’ll be making 500ml, which is the size of the bottle that sports drinks typically come in. To make more, you just need to scale up the ingredients for the quantity you want to make. Easy. The key to making this one work is that you want to find a squash that’s not described as ‘reduced sugar’ or ‘no added sugar’ or else it won’t contain the carbs that sports drinks typically provide. In the above example, we used a ‘hi-juice’ squash / cordial, which contains a relatively large amount of natural fruit juice, but you can use cheaper alternatives. The above bottle would make make ten 500ml servings when diluted and each serving works out at about a tenth of the price of branded sports drinks. 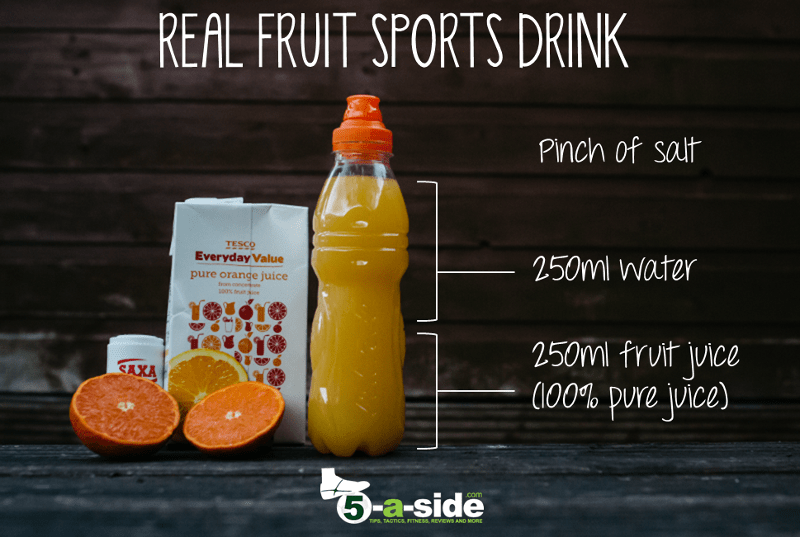 Even with a relatively sugary squash, it only provides a total of around 7g of sugar for a 500ml drink, much lower than the 30-35g of sugar that are in a Lucozade or Gatorade of the same size. If you think you’re missing out, you can add the extra sugar (about 4 teaspoons) and dissolve it in, but very few people will need any additional sugar for exercise lasting under 1 hour. If you are going to dissolve extra sugar in, you’ll find it easier if you’re using warm water. This uses natural fruit juice instead of squash. In the example above we’ve used a budget orange juice, to keep the cost down. It naturally contains 10.4g of carbs per 100ml, so in total our finished sports drink has approximately 26g of carbs, which puts it just about in the ‘isotonic’ bracket, slightly under the amount a gatorade or lucozade would contain, but it tastes more natural and is a fraction of the cost. A carton of ‘value’ juice (from concentrate – which is just as good as juices that aren’t from concentrate) is relatively inexpensive and each serving will cost you somewhere between 10-20% of the cost of a store-bought sports drink. The price will go up as you use fancier juices, but if you prefer the taste of ‘pressed apple and mango’ or ‘pineapple’ then go for it. There’s a bit more preparation involved in this recipe, but it’s worth it. This one is made from natural ingredients and tastes delicious. It’s inspired by the famous mojito coctail. No, don’t get excited, this version won’t contain any alcohol. 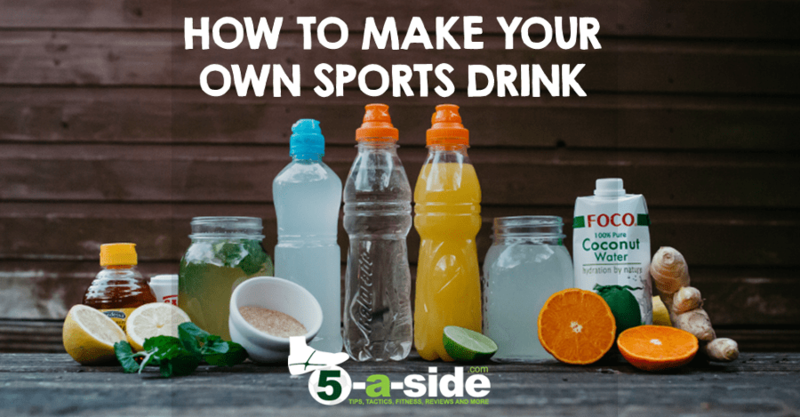 It’s a good sports drink because it naturally contains enough carbs to put it roughly on a par with your store-bought sports drinks, but it’s not got any nasty synthetic stuff that you’ll find in branded drinks. It’s not as cheap as the earlier options, but it’s a delicious natural alternative. Directions: Add a few thin slices of ginger to a large cup of boiled water and let it sit until the flavour has infused. Remove the slices of ginger and squeeze in the lemon, then stir in the honey. Let it cool before pouring into your drinks bottle and leaving in the fridge to chill. Another natural option here. 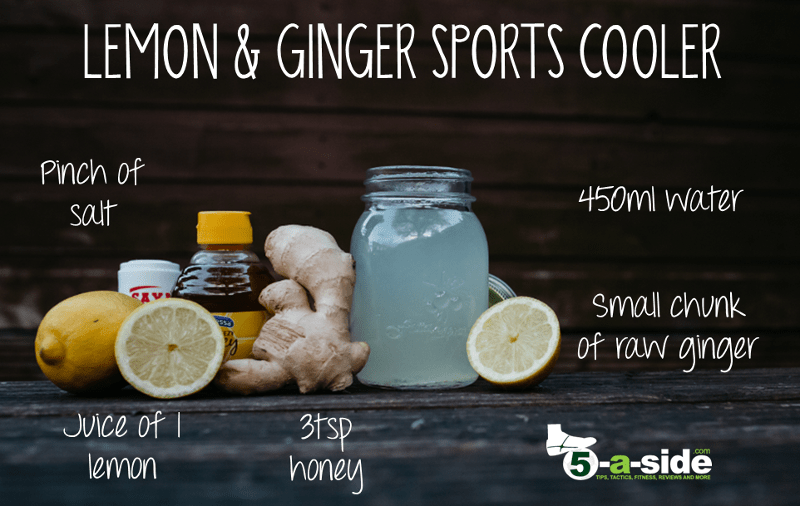 Ginger has been noted as having a high number of health benefits, particularly its anti-inflammatory properties, which is something it shares in common with natural lemon juice. So it’s a good, healthy drink, which also has a hit of vitamin C in it as well. If you want even more benefits, use manuka honey (not cheap) in your mixture. 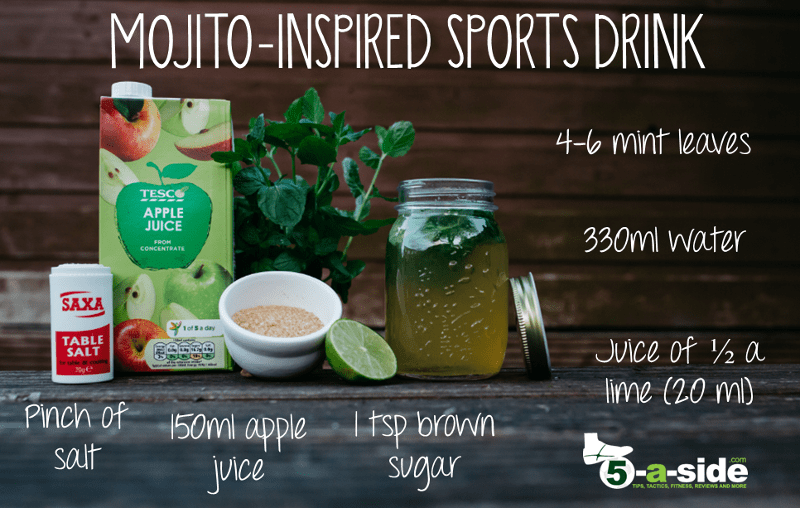 100% natural ready-made sports drinks are hard to come by, and they don’t just grow on trees you know…. Oh, no, apparently they do. 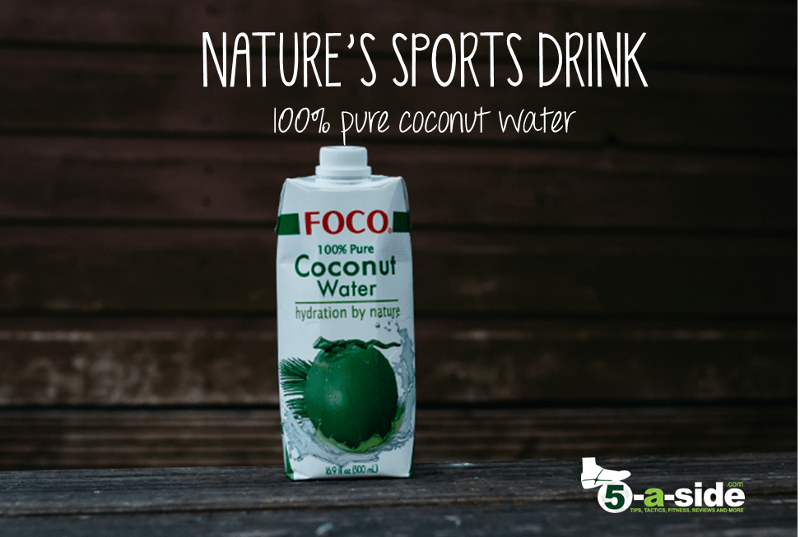 100% pure coconut juice is mother nature’s sports drink. It contains 5g of carbs per 100ml, very close to the amount in a manufactured sports drink and already contains an impressive mixture of minerals such as sodium, potassium, calcium, phosphorus and magnesium. Many of which are also in branded sports drinks. It’s ready to be guzzled exactly as nature provided it but if, as some people complain, you don’t like the taste, try adding some freshly squeezed lemon juice to it. The drawback is that it’s not as cheap as an artificial sports drink (at least not if you’re paying for 100% juice varieties, which is what you should be using), and if you live in the UK it’s got a pretty large carbon footprint getting it to these shores, but when it comes to 100% natural drinks that don’t need any mixing or messing with, it’s hard to beat this. This contains almost zero carbs, which means it’s not a sports drink in the usual sense at all. But the point is that most of us don’t need the extra carbs if we’re exercising for less than 60 minutes so this is a very good option. In some cases these additional carbs can undo the weight-loss benefits that come from sport! The American College of Sports Medicine has stated that “during exercise lasting less than 1 hour, there is little evidence of physiological or physical performance differences between consuming a carbohydrate-electrolyte drink and plain water.” But it still recommends that you have a chilled flavored drink for sport so that you’ll want to drink it. Studies have been performed showing that when drinks are flavoured, kids drink more of them when playing sport (Rivera-Brown et al) and it’s the same for us adults. As for the carbs you need, you can get these through eating a good balanced meal before sport. See our guide to what to eat before football if you need more advice. What do you refer to as a pinch of salt? 500ml of Lucozade sport currently has 0.63g of sodium (salt) in it. A 591ml bottle of Gatorade currently has 0.69g in it. That amount of salt is going to be very difficult to weigh out unless you have a very accurate scale, but you won’t go far wrong if you just literally take a small pinch of salt between your thumb and finger and take that. Hey, I tried these energy drinks recipe and it works just awesome. It is far better than all those chemical flavored energy drinks in the market. Thanks for sharing. Thanks for the comment! I’m really glad you found them useful. I am actually gonna try all of these. To be fair i only drink sports drinks because i like the taste or because i’m hungover. Ha ha. The blue powerade is really nice. But to be fair the ones on here sound nice. Darryl, let me know how you get on. I made them and they were all good – although first time I made the lemon one a bit too bitter! Drinking a blue drink just seems so weird, but you can’t knock the taste!